Java 8 is expected in September 2013. It will include a number of deferred features that were originally planned for Java 7 and also some new ones. Will this be the new release that developers have really been clamoring for? In this series, I will focus on a few features that have been anxiously awaited and discuss what I think they might mean to the community. In the fictional lands of Westeros, the inhabitants recoil at Eddard Stark's warning of a long, many year winter as told by George R. R. Martin in A Game of Thrones. In the real world, Java 8 is coming into a world of Java that is as much in the midst of storm and turmoil as that of the House Stark of Winterfell. In its dust jacket, it claims to show you a better, easier way to succeed in business. Rework (http://www.amazon.ca/Rework-Jason-Fried/dp/0307463745/ref=sr_1_1?ie=UTF8&qid=1336313211&sr=8-1), a New York Times Bestseller book by Jason Fried and David Heinemeier Hansson, explains that to succeed in business you must stop talking and start working – and promises to show you the way. A tall order, but it is backed by the success of the authors with their revered 37signals (http://37signals.com/) suite of collaborative productivity tools and their popular blog, Signal vs. Noise (http://37signals.com/svn). Nikon vs. Canon. Cubs vs. White Sox. Java vs. .NET. These debates have polarized camera buffs, Chicago baseball fans, and software developers so fiercely that they have been called "Holy Wars," a tongue-in-cheek reference to the passion and vitriol with which many real battles have been fought over religious differences. To be sure, arguments over technology by name or brand still have their supporters, but I like to think that many of us in the industry have moved past that. I have been fortunate to work with vets who approach problems and projects by first choosing the most effective tool or platform based on their comparative strengths and weaknesses and how those relate to the task at hand. I love this approach, and these are the practitioners I choose to emulate. Do you consider yourself to be resourceful? Do you thrive in a climate of uncertainty, fear and doubt? Do you know when and how to take calculated risks? Are you an information source or an information sink? Consultants must excel at information gathering and decision making in order to become a trusted advisor. First, Oracle took over Sun. Now, a new version of Java is in the wild and another is being developed. The language has gone Open Source with OpenJDK. Oracle has a lawsuit against Google pending, and the Apache Software Foundation has resigned from the Java SE/EE Executive Committee. Virtual Machine (VM) language support and usage trends beyond Java itself are at an all-time high and climbing. 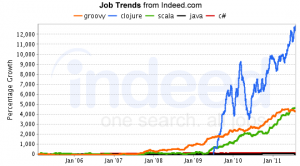 What does it all mean for the future of the Java ecosystem?